Outback 88 photo - 23rd July 1988. 25th January - Sail from Portsmouth. 29th January - Arrive in Newcastle. Visit includes "Ship Open to Visitors". 1st February - Sail from Newcastle. 1st - 15th February - Aviation excercises. 15th - 26th February - Joint Maritime Course (JMC). 1st March - Passing Exercise (PASSEX) with HMS Illustrious. 5th - 10th March - Visit to Hamburg. 10th - 17th March - Exercise MALLET HAMMER. 18th - 22nd March - Vist to Rotterdam. 23rd March - Portsmouth for Docked Assisted Maintenance Period (DAMP) and combined Easter and Summer Leave. 15th April - Cold move to North West Wall. April - Maintenance and Leave period. May - Maintenance and Leave period. 1st June - "Fast Cruise" Exercise. 2nd June - Ammunition ship. 3rd June - Families Day at sea. 6th - 10th June - Shakedown period at sea. 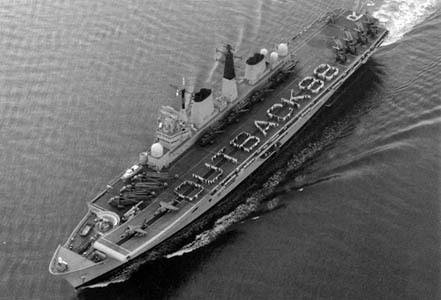 13th June - Sail from Portsmouth for OUTBACK '88. 25th - 29th June - Visit to Malta. 2nd - 3rd July - Suez Canal transit. 23rd July - Ship's Company to muster on the flight deck for the Outback '88 photograph. 23rd July - Arrive in Singapore for maintenance period. 31st July - Visit by the Prime Minister, Margaret Thatcher. 8th August - Sail from Singapore. 13th - 17th August - Vist to Subic Bay, Phillipines. 23rd - 28th August - Visit to Hong Kong. September - Exercise SETIA KAWAN with Brunei defence forces. September - Exercise LIMA BERSATU with Malaysian and Singapore forces. 11th September - "Crossing the Line" Ceremony on the flight deck. 21st - 25th September - Visit to Brisbane. 27th September - Arrive in Sydney. 1st October - Australian Bicentennial International Fleet Review by HRH the Duke of York. 7th October - Sail from Sydney. 13th October - Visit to Melbourne (cancelled). 23rd October - Arrive in Fremantle. 2nd November - Depart from Fremantle. 15th - 19th November - Visit to Bombay (Mumbai). 22nd November - War at Sea Exercise (WASEX) with USS Nimitz. 26th November - "Sods Opera" in the hangar. 1st - 2nd December - Suez Canal transit. 5th December - War at Sea Exercise (WASEX) with FS Clemeceau. 9th - 11th December - Gibraltar. Embark "Sons at Sea". 12th December - Full Power Trial. 14th December - PHOTEX with HMS Invincible and HMS Illustrious. 15th December - Arrive in Portsmouth at South Railway Jetty for a Base Assisted Maintenance Period (BAMP) and Christmas Leave.